Orchard Hill Residents - lock up your hearts! Pansy Parker and Misty Green are rivals in romance. Each believes she is the town's best matchmaker. Now, they're going to settle the question for once and for all. They're keeping track to see who can make the most matches in a year's time. No heart is safe in Orchard Hill - not even their own. 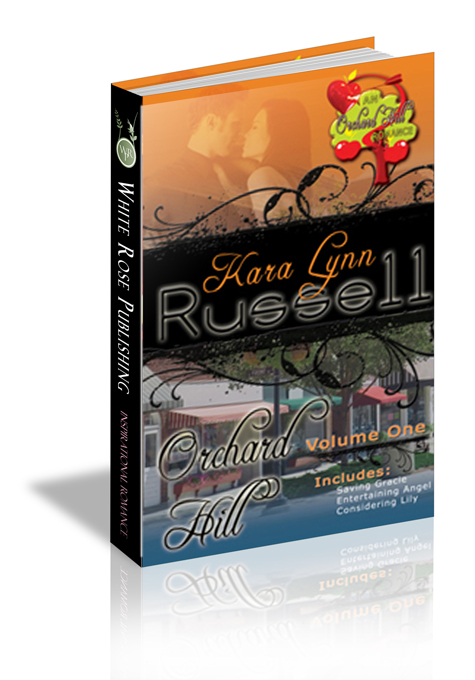 ORCHARD HILL VOLUME ONE Includes: Saving Gracie: Riley O’Neil and Grace Randall have been best friends since kindergarten, and Pansy knows they belong together. After Grace’s fiancée leaves her at the altar, Riley decides it’s time to tell her he wants to be more than friends. Grace is still reeling from her fiancé’s betrayal. She fears that if she and Riley start dating, it will ruin their friendship—and right now Riley’s friendship is something she can’t spare. A new year is coming, and it’s the perfect time for a fresh start. Will Grace take a chance on love with Riley? Entertaining Angel: Artist Angel Marcell is on her own for the first time in her life. If only her brother would stop treating her like a child! He’s asked one of his college friends to watch over her while she’s in Orchard Hill visiting her cousin, Misty Green. Jeff Bradley is working day and night to make his real estate business a success. He doesn’t have time to entertain his friend’s little sister—no matter how cute she is when she blushes. Besides when she’s around, his life turns into chaos and he starts longing for things that aren’t compatible with his business plan. When Angel stands in for a Valentine’s Day date, will he change his mind about what he wants? Considering Lily: No one in his right mind would want to date salon owner Lily Robinson. Since her messy divorce, she has a chip on her shoulder the size of Mt. Rushmore. However, veterinarian Ian O'Neil can't help considering Lily as a potential girlfriend, even though, she is determined not to let any one get close enough to hurt her again... But, with Easter coming, Lily is reminded that the Lord makes all things new, and she wonders if that includes her shattered heart. With Ian's help, can she learn to trust again?